Today at 3:22 p.m., the northern hemisphere titled as far away from the sun as it's going to get, officially kicking off the winter season. At that time, I was standing beneath a spray of lukewarm water in the shower, wondering how much counseling it would take to get this self abuse out of my system. I made (mostly) good on my plan to spend the daylight hours of winter solstice riding. It took longer than planned to get Snaux bike up to snuff, but I was out the door by 9:30 a.m. There was about an inch of new snow and it was building fast. I had to wipe off my goggles every two minutes. It was as wet as precipitation can be and still qualify as white stuff - slippery, slow, and cleverly camouflaging the slew of slush puddles left over from yesterday. Snaux bike doesn't have fenders. I was soaked by 9:45. From there, the blizzard continued for most of the morning. I rode to the end of North Douglas Island and back, coming within a half mile of my warm, dry house before rounding the corner to cross the bridge and head north again, this time on the mainland. Snaux bike was having shifting problems that I could not figure out how to remedy. I could only ride in the lower gears, but with three new inches of slushy snow to plow through, I considered this a hidden blessing. I made it to the Mendenhall Valley, where I did all of my riding on unplowed bike paths and a few completely snow-packed trails. This was the only time all day that I actually felt somewhat warm (I never froze, but I think a good term for my condition would be "groggily damp"). The hard work lulled me into thinking that I had my body temperature back up to normal, so I stopped long enough to choke down a peanut butter and jelly sandwich and take the above picture. Bad idea. My hands went numb and did not respond well to the wet neoprene gloves. 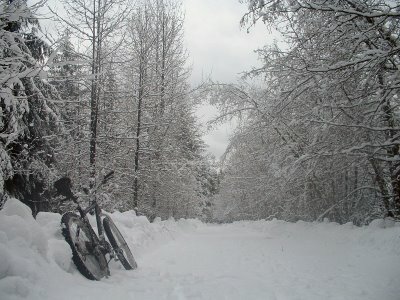 I had to ride two more miles of snow-covered trail with my fingers in a tight fist, steering with my wrists. I wanted to stay out until 3:22 or at least the 3:07 sunset, but by 2:15 I was wet, cold and generally sick of Snaux bike's shifting shenanigans. So I spun out the last 10 miles at crazy high RPMs, and made it home just shy of 3. I'm really not as grumpy about my ride as I sound (a little zapped, but not grumpy) Based on the places I went (I no longer have a working odometer but I know the mileage by heart) I think I still rode between 57 and 60 miles in 5.5 hours today (I'm going high because I deserve it.) That's really not too bad for the conditions - 10 mph on snowy roads was about the max I hit last year, and today I threw in a lot of trails. I really feel like I'm stronger this year. Plus, Snaux bike is actually lighter than my full-suspension mountain bike, and has better control. Now I just need to work on my snow riding. But you know what the craziest thing is? After today's experience, I'll probably still continue riding. I just wanted to drop a line, I found your site through a Google search and I am happy about that! I have lived in Alaska the vast majority of my life, and have also lived on the Oregon Dunes (still moved back to Alaska) and on the south rim of the Grand Canyon (ON IT, and still moved back to Alaska) because of just what you write about: adventure. Only in Alaska can you backpack or hike for days or weeks if so inclined, and not run across two hundred people and six RVs per hour. 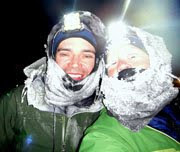 You write descriptive stories about trips I wish I could be taking, and I am happy you take advantage of your place in Alaska. P.S. Oh, and I love your photographs, too! Great story! I also love snow biking. The story makes me pine for a blizzard. We've had no snow in South Dakota. I love the photo ~ it makes me yearn even more for that is my favorite subject bikes and snow.I'm dreaming of a white Christmas this year for that reason. It's not the same riding in the cold without tracking in the snow. Happy Trails and Merry Christmas! I miss winter snow. In Chicago today it is raining. It started raining yesterday and rained all night. It looks like it will be raining all day today. What a waste of good winter moisture. Thanks for letting me ride (with you) vicariously through your blog. i gotta say, i frequent yer blog almost everyday and enjoy the pictures that you post. I miss the snow, right now we are getting rain and it's in the 40's here. I'll trade you the 40 degree weather for a white christmas. Well I an now an Alaskan....I am thinking of taking the name "life in Alaska" now that John in is Texas. Can you add me to you "alaskans" link? It is too bad you left Homer....I am the only Public defender and spend a lot of time down there. Have a merry Christmas. I know you really like your neoprene gloves but you should consider switching. I find the best glove combo for this wet cold weather is Vinylelove gloves(I like the orange ones for their suppleness) as a shell over military wool liners. The combo costs about $10.00. We wear those fishing year round from SE to the northern Bering Sea. I also use the combo when riding. Your hands will never ever be cold riding if you take this advice.